Trawling through the British Newspaper Archive on a separate research project, I stumbled across this interesting article from the Daily Mirror, dated the 29th of October 1979. 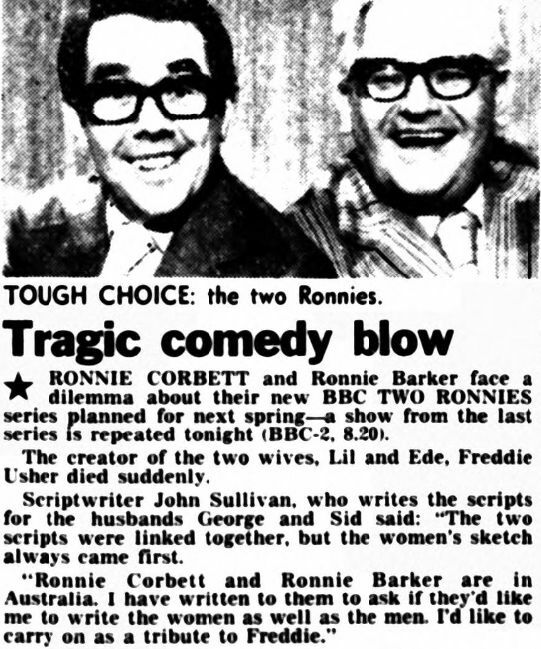 It reported how the death of Freddie Usher (who wrote the Lily & Edie segments of these joint sketches) might mean the characters wouldn’t be seen again (John Sullivan was responsible for writing the Sid & George parts). Whenever I watch these sketches I’m always conscious of the fact that I enjoy the segments with Sid & George much more than Lily & Edie’s contribution. I’d previously thought that this was down to the fact that the Rons in drag never quite convinced (at least outside of their barnstorming musical numbers). Certainly compared to the masters of the genre during the seventies – Les Dawson and Roy Barraclough – the Rons never seemed totally at ease during the Lily & Edie sketches, with the laughs (such as they were) being somewhat muted. But this new nugget of information about the different writers could explain the disparity between the two halves. I’d love to have a complete breakdown of the writing credits for The Two Ronnies but (unless anybody knows differently) there’s not one in circulation. A fair few sketches can be credited (most of Ronnie Barker’s contributions for example and various others, such as David Renwick’s Mastermind) but a fair few are less certain. Even identifying which sketches were penned by the Pythons isn’t clear cut. Moving back to Sid & Lily, George and Edie, it’s interesting that their slot in series seven (broadcast between December 1978 and February 1979) is right in the middle of the programme, exactly where – in previous series – the film serial would have been. Since inflation was biting and budgets were being cut, I can only assume that this year the Rons weren’t able to afford the type of lavish serial they’d previously enjoyed. So this cheap studio sketch had to suffice (the running time of each episode tended to be about five minutes shorter than previous years as well). A last point – if there’s one thing that’s always irked me, it’s the fact that the doubles of Barker and Corbett (seen in the opening titles) look nothing like them. The double of Barker is somewhat on the thin side whilst the faux Corbett seems a little tall. Never mind, one day I’m sure I’ll get over it …. Series two opens with several new recruits to the Wednesday night meetings of the 1-2-1 club. We’ve already met Sylvia (Lucinda Curtis), possessor of an incredibly annoying nervous laugh, during the first series but Rick (Kevin Lloyd) makes his debut here. He automatically expects everybody to know who he is – as Ricky Fortune he had a brief moment of pop glory in 1969 – so is crushed when nobody recognises him. John, nice guy that he is, pretends that he owns all of Ricky’s records, but Kirk recognises this as a barefaced lie and delights in needling the unfortunate Rick. Rick proudly tells them that his big hit went to number one. But not in Britain. Or America. Eventually he has to shamefacedly admit that he was a chart topper in Iceland. Not quite the same thing really. The observant viewer may have noticed that Mrs Arnott isn’t present, this is purely so she can turn up later and scream with delight when she spies her pop hero Ricky! This is another lovely use of Mrs Arnott’s character, which makes Sullivan’s decision to write her out of the series in episode two a baffling move. As I touched upon before, although she didn’t do much her brief contributions were always telling – with the result that her absence was certainly felt. I’ve a feeling that Sullivan was tiring of the 1-2-1 club format, as several later episodes are much more focused around John, with the others rather pushed into the background. The fact that John was becoming more central, a change from the ensemble feel of series one, might also explain why Belinda Lang didn’t appear in the final two episodes (although she briefly returns for the Christmas Special). But another series which starred Lang, The Bretts, was also in production at this time, so it could be that her commitments meant she could only do the four episodes. Either way, she’s another loss. Rick features heavily in the first two episodes and then abruptly leaves. His departure is left fairly open (his confidence takes a knock after believing he’ll be the star of a 1960’s disco – not realising that Louise had already booked Freddie and the Dreamers) but we never see him again. A pity, since Kevin Lloyd (probably best known as Tosh Lines in The Bill) has an appealing sense of vulnerability as the faded pop star. The third episode centres around John’s relationship with his son Toby (played by Ralph Bates’ real son, William). Knowing this, and also being aware of Ralph Bates’ early death, does add several layers of poignancy to any scenes they share. This was the younger Bates’ only acting job – he’s now carved out a successful career as a musician. If Rick’s departure felt like a slight structural oddity, then so are episodes four and five. In episode four we’re told that John has met an attractive divorcee, Liz (Lucy Fleming), but as we never see their initial meeting she just seems to appear out of nowhere. Since John’s the eternal loser it seems obvious that his attempts to romance her will come to naught. This appears to be the case when they both return to his room as he’s astonished to find his best friend Ken (Terence Edmond) sleeping in his bed. Ken’s been turfed out of his house by his wife Maggie (Sue Holderness) and has sought refuge with John. Earlier, John, Ken and Maggie shared an icy dinner together (the highlight being Maggie’s forced politeness – nicely played by Holderness). Ken’s presence puts a dampner on any carnal thoughts that John and Liz might have entertained and she quickly leaves. That, you would think, would be that, but the next day she tells the dumfounded John that she’s booked them into a hotel in Brighton for the weekend. It’s an intriguing point to end the episode on, but that’s the last we see of her. Next time John tells the others that Liz dumped him for another man she met at the hotel (well he did have a Ferrari). Given all we’d seen of Liz during her – admittedly brief – appearance, this seems rather out of character with the result that everything feels very odd. If you create a relationship that looks like it has legs then the audience may feel aggrieved if it’s curtailed in such an off-hand way. Why Sullivan couldn’t have written Fleming into episode five as well is a mystery – as her final, unseen, phone conversation with John doesn’t convince. The slightly strange tone continues with episode six. John’s finally got some good news – he’s shortly to be promoted to headmaster. And when he meets a beautiful young woman called Karen (Elizabeth Morton) everything seems to be going his way. The revelation that Karen isn’t twenty three as he thought, but is a seventeen year old schoolgirl just transferred to his school, is a brilliant comic moment, although it’s an undeniably dodgy topic which you probably wouldn’t find in a pre-watershed sitcom today (always assuming there are any pre-watershed sitcoms of course). I do find Sullivan’s treatment of Karen to be a little troubling. It’s revealed that she has a history of forming relationships with her teachers and has already cost at least one of them his job. Although she’s presented as innocent romantic, just not interested in boys her own age, there’s something slightly off-putting about the way her character is handled. For John, it’s another indication that he’s a born loser. Although innocent of any wrongdoing, his liaison with Karen is enough to ensure that he’s passed over for the headmaster’s job this time. Although David (Frank Windsor) airily tells him he’ll be able to apply in a few year time, when all this blows over. It’s always a pleasure to see Windsor, and since Elizabeth Morton (now acting under the name of Elizabeth Heery) was twenty six when this episode was made it’s possible to find her attractive as a schoolgirl with a clear conscience. But that still doesn’t stop this episode from being a somewhat strange watch. Dear John ended with the 1987 Christmas special. Kate returns – as eventually does Kirk. Peter Blake spends most of the episode as Eric, telling John that Kirk is dead and he’ll never ever be him again. But when Eric, by a stunning coincidence, happens to be present in the same pub where the others have gathered (he’s not brave enough to meet his former friends as Eric) and observes Ralph being harassed by some Hells Angels, he knows what he has to do. Clutching his Kirk suit, which he had planned on binning, he strides into the gents toilets – to emerge as Kirk in all his glory. The Superman theme helps to reinforce the obvious joke, but it’s clearly one that delights the audience as they launch into a round of applause. The notion that Eric is a feeble nobody whilst Kirk is a master of martial arts is hard to swallow, so this is the moment when Dear John jumped the shark (Kirk is able to take on and beat the gang of Hells Angels without breaking a sweat). It’s a great comic moment – as is the sight of Ralph hung up on the coatstand! – but it stretches credibility to breaking point. Still, it was Christmas so we’ll let them off. Better defined character comedy closes the show. John has had a strained relationship with Mrs Lemenski (Irene Prador) for the whole of the run. She regards him as a nutcase and was never backwards in coming forwards to tell him so. But this episode is where we learn a little more about her and discover that she’s just as lonely as the rest of them. But whilst John and the others have the dubious pleasures of the 1-2-1 club, she has nothing, so when she offers to cook him Christmas dinner he – after a brief struggle with his conscience – agrees. His ex-wife has asked him to spend Christmas with her and he’d agreed with alacrity. Mrs Lemenski seems to have put a spoke in this, but I’ve no doubt that John will be able to work something out, meaning that the series ends on a slightly positive note. Although I’ve been slightly critical here, series two of Dear John still has plenty of excellent comic moments, it’s just that when watching it back-to-back with series one it becomes clear that something was missing. Probably John Sullivan was right to introduce new characters and move away from the 1-2-1 club setting (otherwise it could have ended up in a rut) but given the strained nature of some of series two it does seem that everybody was aware that the show had run its course. By the mid eighties John Sullivan was on something of a roll. Having started as a gag writer for the Two Ronnies in the late seventies he then quickly created a trilogy of classic sitcoms – Citizen Smith (1977-1980), Just Good Friends (1983-1986) and the series for which he’ll always be best remembered, Only Fools and Horses (1981-2003). So despite having Just Good Friends and Only Fools and Horses on the go at the same time, Sullivan then increased his workload by adding another show, Dear John (1986-1987), into the mix. Although popular at the time (and it was strong enough to spawn an American remake a few years later) it’s possibly not so well remembered today. This may be because unlike Only Fools it never enjoyed blanket repeats (indeed the last terrestrial outing I can find a record of was back in 1991). It also had quite a short run – two series and a Christmas Special, so just a total of fourteen episodes. It’s sometimes been assumed that Ralph Bates’ tragically early death was the reason why the series didn’t continue, but the last episode aired in 1987 and Bates died four years later, so it seems more likely that Sullivan had run out of ideas for the characters. This is something we’ll touch upon when we discuss series two, as there were several very clear attempts made to shake up the format. The opening titles for the first series act as a very good shorthand to explain the concept of the show. John Lacey (Ralph Bates) returns home to find a Dear John letter – his wife, Wendy, has left him. We then cut to the court, where he looks optimistic (before he goes in that is). Afterwards, things clearly haven’t gone well and he’s forced to pack his bags and move into a dingy one-room flat. From the first scene John is presented as a loser. A nice guy maybe, but a loser. He’s enjoying a solitary pint, when an old friend, Roger (Michael Cochrane), pops up. John attempts to put a brave face on his life as a divorcee, telling Roger that he’s having a great time – parties every night. Roger must be pretty dense as he swallows these obvious lies and then tells him that it’s shame he’s so busy as a few of the lads are heading out for a Chinese meal. John’s now dug himself into a hole – he’d love to go out with Roger and the others, but since he’s created such an active fantasy social life for himself, Roger thinks he’s joking. It’s interesting that Roger never appears again – he seems to have been created as a potential regular (and Cochrane is the sort of actor that would enhance any series) but after this scene he vanishes, never to be seen again. Tired of sitting in his tatty bedsit, he decides to join the 1-2-1 club, a divorced/separated encounter group. It seems to be well attended, although it turns out that most of them are in the wrong room – they want the alcoholics anonymous meeting next door – which caps the opening gag which saw John go into the alcoholics anonymous meeting by mistake. Once that confusion’s been settled we’re left with the motley bunch of characters who will be the main focus of the first series. Ralph Dring (Peter Denyer) is a charisma free zone – seemingly a man with little personality or self-awareness. Kirk St Moritz (Peter Blake) could hardly be a greater contrast – he has personality, far far too much of it and dresses in a way that can best be described as “flamboyant.” Kate (Belinda Lang) is quiet and fairly reluctant (at first) to be the centre of attention, but she’s not as quiet as Mrs Arnott (Jean Challis) who it’s easy to forget is there at times. Leading the group is Louise (Rachel Bell). The characters are clearly defined in their opening scene. Ralph and Kirk are the obvious comic creations, so they’re particularly useful when the mood needs to be lightened after a serious moment (Ralph can always provide a bizarre conversational non sequitur whilst Kirk usually has an insensitive insult ready). Kate is a not such an extreme character, but she has a savage wit which is used to great effect to cut Kirk down to size (not that he ever minds, like a rubber ball he just bounces back). Mrs Arnott rarely speaks – but this is a masterstroke, as whenever she does utter a few words they’re so well chosen by Sullivan that they invariably bring the house down. Louise is something of a monster, although it takes a little while for her true nature to come to the surface. Whilst she gives the impression of solicitous interest in her charges, it’s obvious that she really, really enjoys hearing all the gory details. Her catchphrase (“were there any … sexual problems?”) doesn’t generate any reaction from the studio audience the first time, but when it’s quickly repeated they cotton onto the fact and begin to respond. We see her delight in learning about all the juicy bits very clearly in episode two when John inadvertently goads Kate into admitting that her three marriages broke up because she was frigid. Louise’s pleasure is plain to see and later, in the pub, she continues probing (“did your husbands try and force themselves on you?”) even after Kate’s made it quite plain she doesn’t want to talk about it. This episode also shows Kirk in a different light. He may appear to be rude, obnoxious and narcissistically self-obsessed, but when he learns that Ralph’s razor is broke he goes out and buys him a top of the range replacement. We’re waiting for the gag, but it’s a genuine present and offered in a true spirit of friendship. It’s the hapless John who provides the laughs – he borrows the razor to have a quick shave, but it drops out of his hand into the fishtank (destroying Kirk’s gift and killing Ralph’s replacement terrapins in one fell swoop). Bates, so good at both verbal and non-verbal comedy, is a delight in this scene. The seventh and final episode of the first series is another favourite. Kirk continues to indulge in his wild flights of fancy, which nobody (except for the gullible Ralph) believes. But the extent of Kirk’s fantasy life is greater than anybody realised – as John discovers when he meets Kirk at home. He’s not Kirk at all – he’s Eric Morris, a bespectacled nerdy character who lives at home with his mother (who’s entertainly abusive towards him). The difference between the confident Kirk and the downtrodden Eric is immense (although it just about stays within the bounds of credibility here, unlike the later Christmas Special). And there’s a decent gag at the end, when Kirk returns and berates John for coming round to one of his safe-houses. Did he not realise he was undercover on a dangerous spying mission?! So with a solid series of seven episodes it was inevitable that the show would return for a second series. But whilst series two was still extremely funny in places, there were also signs that the concept was beginning to run out of steam.